ANN ARBOR, Mich. — If you don’t have health insurance, or your insurance coverage still leaves you with big bills, hospitals are supposed to let you know if you qualify for free or reduced-price care, and to charge you fairly even if you don’t. Nearly all (94 percent) of the hospitals reported having a written charity care and emergency care policies, to guide them on deciding which patients could get free or reduced-price care. Though the ACA doesn’t tell hospitals which patients to offer discounts to, or how generous to be, it does say they must have such policies and make them known. Only 29 percent of the hospitals reported they had begun charging uninsured and under-insured patients the same rate that they charged private insurers or Medicare. Such rates are often far lower than the “chargemaster” rates hospitals set as the starting point for negotiating with insurers about how much they will actually accept. 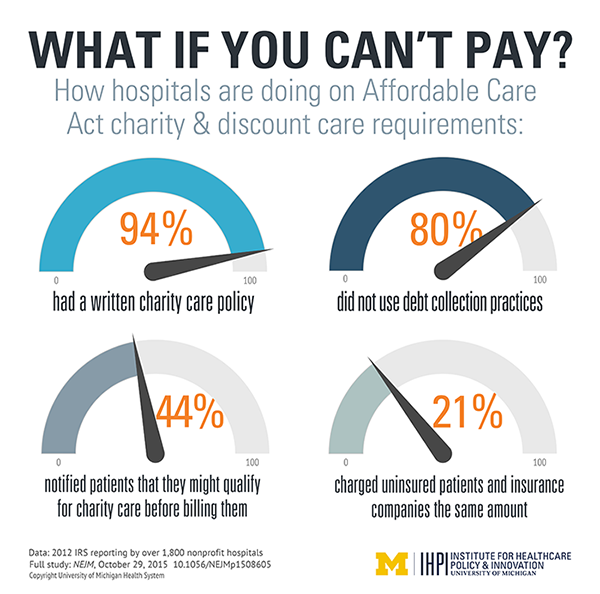 Only 42 percent of the hospitals reported they were notifying patients about their potential eligibility for charity care before attempting to collect unpaid medical bills. The ACA requires such notifications to give patients a chance to apply to get some or all of their costs written off. One in five hospitals had not yet stopped using extraordinary debt-collection steps when patients failed to pay their medical bills. Such steps, such as reporting patients to credit agencies in ways that can damage their credit scores, placing liens on their property or garnishing their wages, are now banned. Hospitals in states that have not expanded Medicaid reported having less generous charity care policies, and were less likely to have a policy about notifying patients of charity care options before they left the hospital. In general, patients have to be poorer to get free or discounted care in these states than in states that have expanded Medicaid. Only 11 percent of hospitals reported having conducted a community health needs assessment in the past three years as of 2012. Such assessments, to identify pressing health issues in the population they serve, don’t necessarily affect charity care. As more Americans enroll in insurance plans that have high deductibles, they may find they need to ask for financial relief after a hospital stay. Even a single person earning $40,000 a year, or a family of four with an income of around $80,000, might qualify for discounts from many hospitals.